Fabric? Is that all I am to you? My blood may be colorful and glittery, but I bleed nonetheless. My people have long struggled to be taken seriously, it is why so many of us turn to our faith, our creator: The Hand. It is a force within all of us that guides our actions and speaks through all Muppetborn. The war of my people is far from over, and it will be the bloodiest yet. Waka waka. 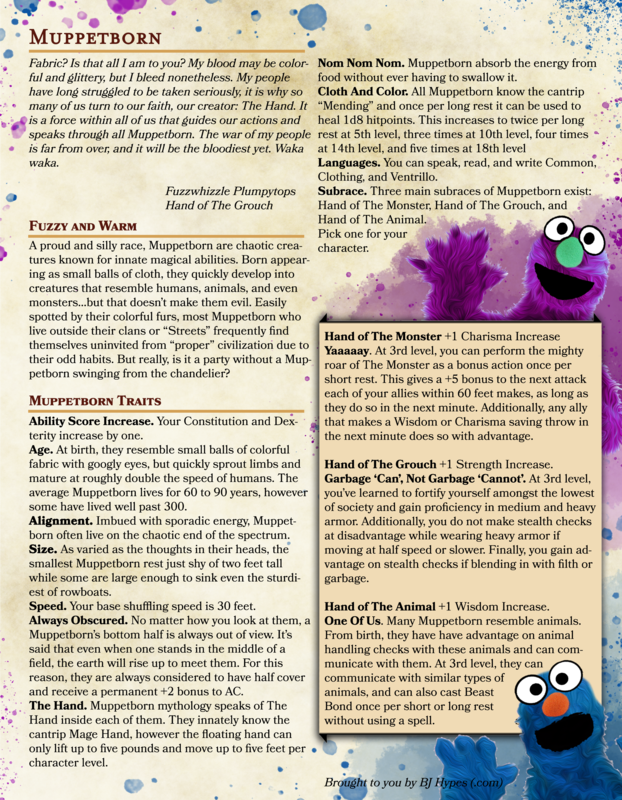 A proud and silly race, Muppetborn are chaotic creatures known for innate magical abilities. Born appearing as small balls of cloth, they quickly develop into creatures that resemble humans, animals, and even monsters…but that doesn’t make them evil. Easily spotted by their colorful furs, most Muppetborn who live outside their clans or “Streets” frequently find themselves uninvited from “proper” civilization due to their odd habits. But really, is it a party without a Muppetborn swinging from the chandelier? Ability Score Increase. Your Constitution and Dexterity increase by one. Age. At birth, they resemble small balls of colorful fabric with googly eyes, but quickly sprout limbs and mature at roughly double the speed of humans. The average Muppetborn lives for 60 to 90 years, however some have lived well past 300. Alignment. Imbued with sporadic energy, Muppetborn often live on the chaotic end of the spectrum. Size. As varied as the thoughts in their heads, the smallest Muppetborn rest just shy of two feet tall while some are large enough to sink even the sturdiest of rowboats. Speed. Your base shuffling speed is 30 feet. The Hand. Muppetborn mythology speaks of The Hand inside each of them. They innately know the cantrip Mage Hand, however the floating hand can only lift up to five pounds and move up to five feet per character level. Nom Nom Nom. Muppetborn absorb the energy from food without ever having to swallow it. Languages. You can speak, read, and write Common, Clothing, and Ventrillo. Subrace. Three main subraces of Muppetborn exist: Hand of The Monster, Hand of The Grouch, and Hand of The Animal. Pick one for your character. Yaaaaay. At 3rd level, you can perform the mighty roar of The Monster as a bonus action once per short rest. This gives a +5 bonus to the next attack each of your allies within 60 feet makes, as long as they do so in the next minute. Additionally, any ally that makes a Wisdom or Charisma saving throw in the next minute does so with advantage. Hand of The Grouch +1 Strength Increase. Garbage ‘Can’, Not Garbage ‘Cannot’. At 3rd level, you’ve learned to fortify yourself amongst the lowest of society and gain proficiency in medium and heavy armor. Additionally, you do not make stealth checks at disadvantage while wearing heavy armor if moving at half speed or slower. Finally, you gain advantage on stealth checks if blending in with filth or garbage. Hand of The Animal +1 Wisdom Increase. One Of Us. Many Muppetborn resemble animals. From birth, they have have advantage on animal handling checks with these animals and can communicate with them. At 3rd level, they can communicate with similar types of animals, and can also cast Beast Bond once per short or long rest without using a spell slot.